Science Fiction | Caught in a book! This book is the first of a series of books set in the same world. Each one has a standalone romance, yet the larger arc, spanning the series, is more of a quest that takes centuries and many heroes to complete. The setting is intriguing, and I’m already hooked. I loved it. This was one of the books Ilona Andrews recommended on her blog and it had been sitting in my kindle since that day. I’ve found she rarely goes wrong with her recommendations. 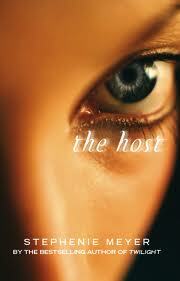 So I read Stephanie Meyer’s Host a few years ago. After I finished it I couldn’t understand why more people hadn’t read it or even heard about it. My exposure to science fiction has been mostly through Star Trek (Original, Academy and Voyager) and Asimov. So perhaps that’s the reason I’m not offended by a science fiction novel that isn’t gritty and technical and that doesn’t talk about black holes or particle accelerators. See, I love fantasy fiction too. I thrive on the fantastic new worlds authors of this genre build and explore. I love how they people these worlds and walk a fine edge between making this other world familiar as well as different enough to intrigue us. These worlds would be unimaginable without magic or at least a heavy suspension of disbelief. But the best of these stories are always character driven – where the people living in those worlds show the effects of the politics and warfare and culture through their interactions and through the many stories that stand on their shoulders. To my mind, Host fulfilled the two things I want out of my fantasy fiction – great characters and a world building that unfolds and shows its effects through the actions of those characters. I don’t care that it was done under the aegis of science fiction. I could sit down and tear the book up with criticisms. It’s flawed, of course it is. The whole story hovered between wanting to be serious and dark and wanting to be accessible to eleven year olds. But I got what I wanted out of this book and so I’ll save the hypocrisy. For a novella it is actually a pretty decent one. I start with ‘for a novella’ because usually the limitation of words either results in a rush of sequences or in untidy, abrupt narration. Neither style is very fulfilling. I’ll begin by the worst fault of the book – the absolutely heinous, most maddening, unpardonable of all its flaws – it’s too short. The premise is set beautifully. The first 25% of my ebook takes me from a war torn world, where existence is a punishment to be endured in service of a cause beyond your understanding and with loyalty to an unfeeling corporation trapped in an unending battle began and run by greed, to a planet where every colour is bursting with life and touch, scent and taste are allowed to bring forth the best and the worst of your emotions. Claire Shannon leaves her dreary, apparently inescapable life in Uley and arrives in Rada, in the flower province of Dahlia. If you’ve read the first Kinsmen novella, Silent Blade, then you know about this province. You know the wealth and power the gifted Kinsmen wield and their constant battle for supremacy tempered by tradition, protocol, customs and alliances. Here Claire arrives as a refugee after enduring a painful scan by the immigration officers that could unveil her secret- that she was a trained psycher in Uley and that she can kill with her mind. She passes the test and her brain is declared inert. She is given a job recommendation and arrives at Guardian Inc. for her first interview. Here she meets the head of the Escana Kinsmen family, Venturo Escana, who looks at her drab clothing, chemical stained hair and hires her out of pity. She becomes an Admin in his office. She leaves Guardian Inc. that first day her mind reeling from the beauty of the Adonis who had stood in front of her and the startling brightness of his powerful mind, and coming to grips with her chagrin at being pitied by some one as magnificent as him. And so the preview ended. I was almost panting for what came next. The authors were ridiculously good with the details and made sure I appreciated her position perfectly. They described both her home planet and the new one that she was coming to love with vivid strokes from a mixed pallet. This could have gone in so many ways, and while I stewed over what can happen next for two weeks (till the book came out), I knew I could safely leave the story in the hands of two of my favourite authors. My imagination frankly couldn’t come up with anything remotely satisfactory. The best part is that they skimmed over everything I would have wanted them to go into. The worst part is that they skimmed over everything I would have wanted them to go into. There was the office romance, there was the fight between Claire and Venturo in their psycher forms (inside the bionet), and there was the final ‘F U’ to the bad guys when her truth came out and the two ganged up to teach the idiots a lesson, there was even a little disapproval from a family member to keep the plot well rounded – but dammit, why did they have to make it so short? It seems such a waste of a wonderful plot-line filled with so much…potential! I can’t get over that. I’m going back to my kindle app to read it again. Maybe I’ll feel less emotional about it tomorrow. Probably not. DISCLOSURE: I emailed Ilona Andrews complaining about how the ebook was only available in Amazon and B&amp;N, and neither would sell it to me (Amazon- wont accept my visa card, B&amp;N- wont sell to anyone but US and Canadian citizens), and pleading them to put it up on smashwords. They sent me the ebook in two formats in answer. That was the sweetest thing! !